The Shopping in downtown Ocean Springs deserves its own post! There are are so many boutiques, gift shops, and specialty stores. To see them all it will take a full day . They are up and down Washington Avenue and Government Street. My advice is to stop by the Ocean Springs Chamber and get a map so you don’t miss any of these cute stores. My friend Lori (follow her @thelovelyride) and I shopped all day and shot for four really cute stores. This should give you a little taste of what you will find. You should also check out my Instagram Stories this week for a peak inside these four stores . All stores are happy to ship. Lee Tracy 1000 Government St 228-447-4249 They have a large selection of Women’s Clothing and Accessories for all ages. I really love the beach vibes in this store but they also have a lot of really nice basics.too. OTS Top-$158 Denim Shorts $58 Weekend Vibes Tote- $4o Embroidered Dress $158 Spotted Hide Bag $305 Follow them on Facebook and Instagram. J Laurie Shoe Boutique 628 Washington Ave 228-243-5408 This store has the largest selection of comfortable cute shoes that I have seen anywhere. 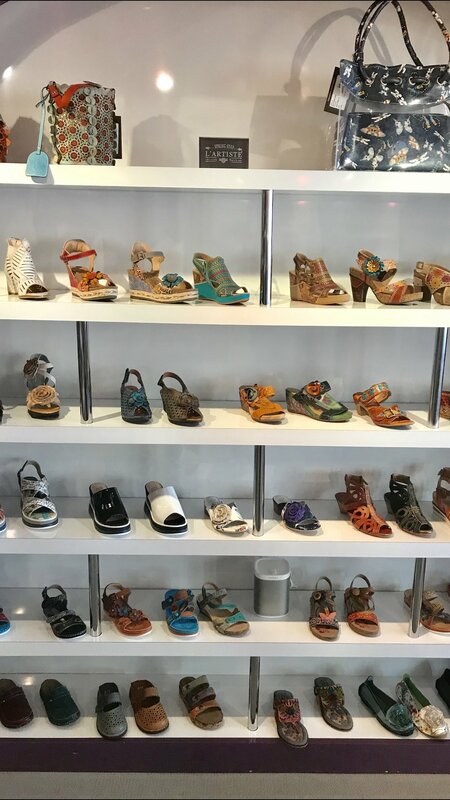 If you are having a hard time finding cute comfy shoes you will thank me big for this post. Black and White/ White and Black Wedges $99 Mixed Pattern Wedge $110 White Cut Out Detail Block Heel $119 Follow them on Facebook. There are many other fun boutiques and gift shops to check out. When you do let me know your favorites. For those of you who love a good Spa Treatment I would like to mention Emma Bains and The Red Lily. Spa She is wonderful but you need to book it early she stays really busy. 228-215-1923.